As you read "e;Keeping it Real II! 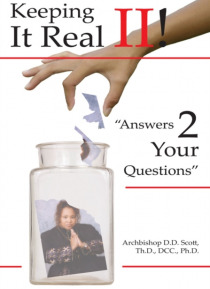 Answers 2 Your Questions"e; by Author, Archbishop D. D. Scott, The Tabernacle comes alive right before our eyes. As we walk with her through the Tabernacle, we realize that instead of taking a tour, we are actually having a real, active experience of our life in Jesus. This book is full of the Word and deep. Not deep in the sense that it is difficult to u… nderstand, but deep in the sense that it penetrates to the spirit and soul. Although this book is so compelling it can easily be read in one sitting, the reader is provoked to stop from time to time as The Holy Spirit leads to allow the Holy Spirit to immediately do His life changing work.